The Addams Family: Paramount, widescreen 1.85:1/16x9, languages: English DD 5.1 [CC] & Dolby Surround, subtitles: English, single side-single layer, 18 chapters, 2 theatrical trailers, rated PG-13, 99 min., $29.99, street date 2/22/2000. Addams Family Values: Paramount, widescreen 1.85:1/16x9, languages: English DD 5.1 [CC] & Dolby Surround, subtitles: English, single side-single layer, 16 chapters, 2 theatrical trailers, rated PG-13, 94 min., $29.99, street date 2/22/2000. Addams Family: Directed by Barry Sonnenfeld. Starring Anjelica Huston, Raul Julia, Christopher Lloyd, Christina Ricci, Elizabeth Wilson. Academy Awards: Nominated for Best Custome Design, 1992. Looking for something CREEPY…SPOOKY…KOOKY…and altogether OOKY? Come join The Addams Family for the most hilarious scarefest of this season or any other! When long-lost Uncle Fester (Lloyd) reappears after twenty-five years in the Bermuda Triangle, Gomez (Julia) and Morticia (Huston) plan a celebration to wake the dead. But Wednesday (Ricci) barely has time to warm up her electric chair before Thing points out Fester's uncommonly "normal" behavior. Could this Fester be a fake, part of an evil scheme to raid the Addams fortune? Addams Family Values: Directed by Barry Sonnenfeld. Starring Anjelica Huston, Raul Julia, Christopher Lloyd, Christina Ricci, Joan Cusack, Carol Kane, Jimmy Workman. Academy Awards: Nominated for Best Art Direction-Set Decoration, 1994. God save us from movie versions of TV shows! Okay, my protests may seem a bit disingenuous since I enjoy all the Star Trek films and I also liked the X-Files movie, but those differ from most TV remakes in that they featured the original casts. Most of the time when a TV show hits the theaters, it's with a crew who had nothing to do with the series. Oh, they might toss in some of the old performers in cameos, but that's about it; otherwise we only deal with actors who replace the parts' progenitors. And we also have to deal with films that are usually pretty crummy. Face it: there's probably not a lot of creativity happening when you hit such a low rung on the inspiration ladder. If you look at the remakes that don't use the original performers, the number of these kinds of films that are truly noteworthy can be counted on one hand. Actually, one finger: The Fugitive. Other than that, most of these pictures are dreck and border on being unwatchable. However, the two films based on The Addams Family - 1991's The Addams Family and its sequel, 1993's Addams Family Values - represent some of the better efforts in this genre, especially the surprisingly-entertaining first film. No, they won't win any awards, but for their ilk, they're some of the better movies out there. As I alluded, the first film is definitely the stronger of the two, and it's bolstered mainly by a very strong cast. The producers of TAF didn't skimp and it shows with a crew of terrific actors like Raul Julia, Anjelica Huston, and Christopher Lloyd. None of these actors were then or are now huge names, but they're solid performers whose work added a lot of credibility to the project, and they're all very good. I especially liked Julia's frightfully manic acting as patriarch Gomez. All at once he makes the character suave and dashing but also often displays an incredible amount of child-like glee and zest - it's a great performance. Most notable among the actors, however, is then-little Christina Ricci as sullen and morose daughter Wednesday. This wasn't her first movie - actually, it was her third, after turns in both Mermaids and The Hard Way - but it was a breakout performance as she stole every since in which she appeared with her morbidly dark but wittily nasty tone. Her success in the role directly affected the sequel, as she receives much screen time in AFV. TAF also is served well by the hyperkinetic directing of Barry Sonnenfeld. Sonnenfeld earned note as a cinematographer, primarily through his efforts alongside the Coen brothers (Raising Arizona, Blood Simple, Miller's Crossing, though he'd also worked on hits like Big and Misery. TAF was Sonnenfeld's initial directorial attempt, and he quickly establishes what would become his signature style of flashy camera movements. For the most part, Sonnenfeld's spastic style works well for TAF because it brings a new energy to the piece. Not content to simply rehash the TV show, Sonnenfeld's high level of activity makes the movie something different and fairly exciting. Even after all these years - and similar style in most of his other films - it still seems pretty fun here, and the movie as a whole remains witty and entertaining. Things aren't quite as rosy in regard to the sequel, Addams Family Values. While the movie has some entertaining moments, it generally appears as a pale imitation of the first film. All the same components are there, but a certain spirit seems lacking. Sonnenfeld's camera flies all around us, but it appears even more flashy and insubstantive than during the original movie; you get that serious "been there, done that" feeling during the sequel. Most of the cast aren't up to their old standards as well. All seem more subdued this time around, and Julia appears much less animated and exciting than in the first film. Huston didn't have to exert much energy in the first place, but even she looks a bit worn and bored with the proceedings. One saving grace comes from another great performance by Ricci; her added prominence in the sequel almost single-handedly rescues the film. She takes a slightly tired conceit - a humorless character who tries to smile - and makes it a thing of wonder; that scene is the highlight of the entire picture. Other than that, there's not much to say. Joan Cusack appears sexier than ever before as "black widow" Debbie Jellinsky; that may not say much, but she really does look very hot. Actually, the supporting cast is a bit of a step up from the first picture. For reasons unknown, Carol Kane replaces Judith Malina as Grandma; she's no better in this very minor role, but hey - at least she's a name! Peter MacNicol and Christine Baransky play prominent supporting roles, and Nathan Lane, David Hyde Pierce, and the ever-delightful Tony Shalhoub also turn up in bit parts. (Shalhoub rules, and don't you forget it!) I also found it interesting to note that young Mercedes McNab appears in both films, though it's unclear if she's supposed to play the same part; she's got the bigger role as insufferable Amanda here, and she played the insufferable Girl Scout in the first movie. These are the kinds of things you consider when you're sort of bored with a movie. Don't get me wrong: AFV is a reasonably watchable film, but it's not very good, and I couldn't help but find it to be a let-down after the semi-inspired original movie. Maybe I'd like it more if I hadn't viewed them both back-to-back, but as it stands, AFV is a fairly mediocre effort. Other than the quality of the films and some of the actors, one other strange difference exists between TAF and AFV. The first movie used a very bleak, colorless palette for the most part; while it wasn't quite black and white, it wasn't that far from it, especially during the scenes that took place in the Addams mansion. A few reds appear, such as from some crushed velvet and roses, but the movie generally sticks with an appropriately lifeless color scheme. For AFV, however, the entire production seems much warmer. Skin tones particularly appear darker and more life-like. Unfortunately, that's not what we should see in this kind of movie. While they don't exactly look like they've been hanging out at the beach, gone is much of the ghastly pallor that affected all in the Addams abode, and this makes the whole group seem more normal and human. Why they went for this normalizing effect is a mystery to me, but it definitely backfires; everything seems far too sweet and nice. One other annoying production decision mars AFV. In the first film, an eerie white light occasionally glowed around Huston's eyes, which created an interesting effect that seemed reminiscent of old-time movies. However, in the sequel, this light is always there on her face, and it becomes a very self-consciously arty effect that grows tiresome at a rapid rate. Once again, inspiration fails in the second film. The Addams Family appears in its original theatrical aspect ratio of 1.85:1 on this single-sided, single-layered DVD; the image has been enhanced for 16X9 televisions. While not flawless, the picture looks quite good and it offers a very satisfying viewing experience. Sharpness appears consistently defined and crisp, with only very rare instances of softness (mainly on wider shots). Moiré effects and jagged edges are also infrequent, though not nonexistent, and I saw few problems related to the anamorphic downconversion on my 4X3 TV. The print itself seemed clean; some mild speckling occurs at times, but no other instances of grain, marks or other flaws were apparent. As I related earlier, The Addams Family maintains a very limited palette for much of the film. Nonetheless, these colors seemed nicely reproduced and appeared pale but fairly natural. More importantly, black levels are absolutely terrific; they're deep and rich, and shadow detail appears appropriately light but still realistic. All in all, the film looks quite good. The Addams Family also offers a surprisingly good Dolby Digital 5.1 soundtrack. While not a very old movie, it appeared before Dolby Digital or DTS really entered the marketplace; by 1993, Dolby Digital had been in cinemas for a year or so and DTS also hit the screens, so that's really the first year that I expect "modern" audio from a film. Despite that slight handicap, The Addams Family sounds very good. The soundfield is nicely broad but also well-defined, with audio that is placed accurately in the environment. The front soundstage dominates, but the rears also play an important part, and we even get some effective split-surround usage from time to time. Audio quality was great. Dialogue could sound slightly rough on occasion, but it generally appeared clear and natural; I never had any trouble with intelligibility. The music seems clean and bright and displays strong dynamic range, and the effects are realistic and pack a good punch; The Addams Family offered a surprising amount of bass throughout the film. It's not one of the all-time greats, but this soundtrack nonetheless seems very effective. Addams Family Values appears in its original theatrical aspect ratio of 1.85:1 on this single-sided, single-layered DVD; the image has been enhanced for 16X9 televisions. This film also looks quite good, but a few additional flaws keep it from being as strong as its predecessor. Sharpness also appears generally strong, but softness creeps into the image more frequently. Moiré effects also are more apparent and we see some additional jagged edges; actually, a bit of edge enhancement seems to have occurred for this release. I also detected some slight artifacts from the anamorphic downconversion. None of these issues are overwhelming - in fact, they're fairly modest - but they add up to a somewhat less effective experience. The print itself still seems clean and free of defects for the most part, though I saw a bit more speckling throughout the movie. I may not have liked the color scheme used for the film, but I can't complain about its reproduction; the various hues seem natural and well-saturated. Black levels remain dark and solid, and shadow detail also appears appropriate. AFV is a step below the original in regard to picture quality, but it's a pretty small step. The same can be said for the film's Dolby Digital 5.1 soundtrack. It also sounds quite good but it doesn't quite match up with the high standard set by the first film. The soundfield seems nearly identical, with nicely broad imaging in the front and some good use of the surrounds to bolster the audio. Quality is pretty similar but slightly worse. Dialogue appears a bit more muffled and flat, and the music doesn't seem quite as vivid as in the first movie. Effects remain realistic and still pack a nice auditory punch. All in all, it's a good soundtrack, but just a little less powerful than the one we heard for the original movie. For AFV, the roster of supplements remains the same: we get two theatrical trailers for this film. Weren't there some promotional featurettes they could have tossed in, or anything else? Gotta be something sitting around the vaults, you'd think. While both Addams Family films are watchable, only the first offers any real entertainment. It's a hit or miss affair, but some energetic acting and camerawork make it a consistently fun affair. Its sequel, Addams Family Values provides some occasional wit, but for the most part it's a pretty stale rehash of the first film. Both DVDs provide very good picture and sound - though TAF has a slight edge in both categories - and both also feature almost nothing in the way of supplements. The Addams Family is definitely worth a rental, and you may want to add it to your collection if you enjoy this kind of broad humor; Addams Family Values merits a rental at best. The Unofficial Addams Family Web Site--An excellent site with categories on cartoons, TV series, movies, pictures, sounds, history, FAQ, new, links, and collectables. 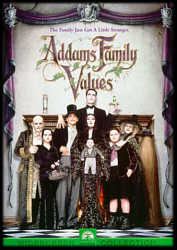 Amazon.com--Available to purchase are The Addams Family and Addams Family Values at special discount. 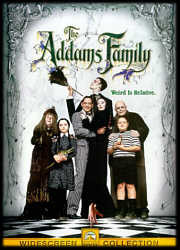 Reel.com--Purchase The Addams Family and Addams Family Values at special discount.